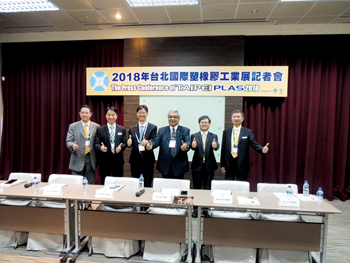 Taiwan plastics and rubber machinery manufactures must work harder to increase their exports to the Middle East countries, officials said at a press conference held during the TaipeiPLAS exhibition. Responding to a question from Gulf Industry magazine, officials admitted that Taiwanese manufacturers are yet to fully exploit the potential of the Middle East market. The Middle East a huge but price-conscious market and the incorporation of Smart technologies in machines and the region’s move towards Industry 4.0 will help Taiwan’s technically advanced producers to increase exports to the region, they hoped. Saudi Arabia is the biggest market in the region for Taiwan’s plastic machinery manufacturing sector with exports worth about $17 million last year. “Actually, in the Middle East, Africa and East Europe, we have to explore more as they are just 10 per cent of the overall exports, while Vietnam itself accounts for more than 12 per cent,” said an official. “In short, we have to work harder to export more to the Middle East,” he said. They also felt that the latest trade war between the US and China will help Taiwan’s exports to US. If manufacturing increases in the US, it will increase demand for Taiwanese machinery in that country, they felt.